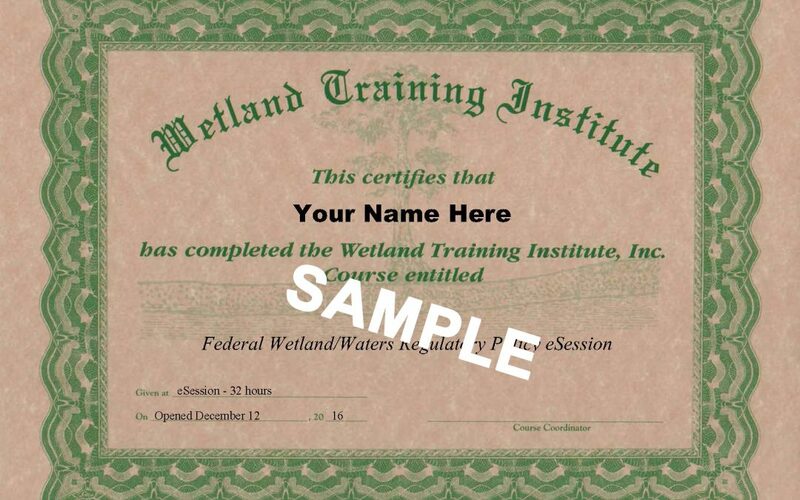 Certification - Wetland Training Institute, Inc. Does my WTI course count towards my certification program? The Wetland Training Institute, Inc. is a private provider of training in both technical and policy topics related to wetlands and specifically their relevance to federal regulatory programs. It is not affiliated with any government entity, professional society or other institution. WTI has been training professionals since 1989 and its courses have always been recognized for continuing education requirements. WTI offers quality professional training but does not “Certify” the competency of the participant. We urge those interested in professional training to fully investigate claims offering “Certification” associated with training courses. Much the same as colleges and universities do not “certify” the professional competency of its graduates, WTI does not purport to pass any judgment upon the professional qualifications of anyone that has completed its courses. While some of the WTI courses have “testing” provisions as part of the curriculum, the testing is specifically to assist the participant to recognize their own level of proficiency – not to grade that proficiency. At the successful completion of any course provided by WTI, the participant will be awarded a “certificate of completion” that specifies the contact hours required to complete the course. Your certificate of completion can be used to document instructional hours received in a topic. Typically, our courses are accepted by certifying agencies and associations; however, you should confirm that with the specific certification program to which you are applying or renewing to find out how they will assess or credit your WTI course(s). In the 1990’s the U.S. Army Corps of Engineers (USACE) ran a demonstration phase Wetland Delineator Certification Program. All of the WTI delineation instructors at that time participated in the trial program and were “Provisionally Certified.” That certification expired in March 1994. The USACE abandoned its certification program because the Congress failed to fund it in the Appropriation Bill. Some states have from time to time established delineation certification programs and some of those programs may still exist. Such programs have their own authorization and provisions for certification. The process of certification that such societies have instituted requires at a minimum, a college degree, multiyear experience levels, recommendations from other professionals, and continuing education. The process is more rigorous than simply taking one or more short training courses, which, as with academic courses, may be successfully completed by individuals that lack applied competency in a specific discipline. Note also that “Certification” is NOT “Licensing”. Licensing is conducted by governmental agencies under the authority of a law passed by a legislature. Under the law, the legal authority to license is assigned to an agency responsible for governing the activity for which an individual is being licensed. Licensing generally requires that an individual pass rigorous testing.